It’s unrealistic to think that your confidential information and data is fully protected. No matter what type of secure systems you may have in place, there’s always a risk of theft – especially if you still deal with paper documents. Today’s businesses must hire professional document destruction companies to ensure their information is destroyed properly. Company information, proprietary secrets/formulas, client records and employee files must all be safely destroyed when they are no longer useful. But the most prominent reason companies choose to shred regularly is to save money. First and foremost, regularly scheduled shredding services save you from paying your employees overtime. It allows your current employees to be more efficient and productive so they can continue to focus on more important business matters. In order to start with this type of service, the provider will install document collection containers within your office space, allowing employees to discard items in a secure fashion. These containers are then emptied according to your customized schedule and your documents are then shredded safely and securely. Another way companies will save money is to avoid costly penalties associated with the safety of confidential information. A shredding service can help your company regularly maintain compliance with all of the regulations surrounding information and privacy. The Health Insurance Portability and Accountability Act (HIPAA), the Fair Trade and Accurate Credit Transaction Act (FACTA), and Gramm-Leach-Bliley (GLB) all enforce federal standards on privacy of confidential information. Shredding on a regular basis ensures you will meet all the privacy protection standards. The service provider will offer proof that your items have been shredded in a Certificate of Destruction. Having this proof also reduces any other potential liability risks your business may face. Most businesses rely on their good reputation to maintain a constant flow of customers. When documents are not properly destroyed, they may fall into the wrong hands and this could affect your company’s reputation. To manage the negative PR could cost you hundreds, if not thousands of dollars – that’s money out the window! Your clients, your employees, and possibly your whole community will no longer trust your business practices. It’s best to find the right professional for the job – make sure the one working for you is screened, uniformed and has experience in shredding and destruction. Typically, customers choose to have the shredding done at their business location by a mobile shredding truck, but it’s also possible to have the items transported to a secure warehouse where the shredding is executed. Save you money – our regularly scheduled shredding services cost less than $2.00/day! Contact us today for more information on our services. We’re happy to answer your questions! There are so many secure shredding and destruction services out there, ready and able to work. So exactly how do you know which one is right for your company? There are several questions you will need to ask yourself before you make your choice. Exactly how much paper do you have to shred? This will be the first question any secure shredding company will ask. It’s essential that you review your confidential and sensitive information on a regular basis to take stock of what you have. Then you’ll be able to better estimate what needs to be shredded or destroyed. Most of these companies will lower their prices if you have a larger volume of paper to shred or destroy. It’s easy to measure by whether your paper fits into a recyclable grocery bag, a banker box or a large file box. On average, a recyclable grocery bag will hold about 10-25 pounds or 100-1500 sheets of paper. A standard banker box holds about 30-35 pounds or 2,000 to 5,000 sheets of paper. A large legal file box holds around 50-60 pounds or 4,000 to 5,000 sheets of paper. For a comparison, our shred containers hold between 100-350 pounds of paper. How do you want your documents shredded? There are several factors that are dependent on how this question is answered. First of which is how much you have to shred, second is how much you want to pay, and third is the timeframe in which the job must be completed. There are three main methods of shredding and destruction, but depending on your needs, you may find one of them most ideal. Drop-off shredding — Some secure shredding companies allow you to drop off your documents at their warehouse. Your documents will be stored in a secure area in a locked container until they are shredded. Typically, with this method, you will pay by the pound, by the box or by the bag. Off-site shredding — If you choose this method, the secure shredding company will visit your location and haul your documents away to a shredding facility. It’s uncertain in what timeframe they will be shredding your documents. It usually depends on when they have enough volume of paper to warrant operating their equipment. Although this is a cheaper option, it is definitely less secure than mobile onsite shredding. Having your information unmonitored can make your business vulnerable to theft before they are shredded. Mobile shredding — With this method, secure shredding services are executed on a mobile shredding truck that has an onboard, hydraulically-powered shredder with a chute. The truck will drive to your location and will shred your documents on site. Because the amount shredded is typically larger than the other methods, the price is lower per pound. The true benefit is that you would be able to witness your sensitive information being safely and securely destroyed. What level of security are you looking for? One of the most crucial factors when comparing shredding companies is their level of security. Whichever service you choose, be sure to find one that is NAID certified. The NAID is the National Association for Information Destruction. When these service companies carry this certification, it implies that they are compliant with all shredding laws and standards as observed by NAID. This organization randomly audits its members to determine compliance. In order to make this decision, we hope you will weigh the information we have shared with you. Our customers continually choose our experienced secure shredding team to help shred and destroy their confidential information. We’re here to answer any questions you may have about our services – contact us today! See Recycling Today’s article on us! In today’s world, paper documents and digital storage devices store confidential information for businesses around the globe. It’s crucial to have this information protected and when it’s no longer useful, businesses must shred and destroy these items properly to avoid fines, penalties and even lawsuits. Most businesses believe that hiring a mobile shredding company will be too expensive for their budget. They think it’s cheaper to have an internal employee sit next to a small office shredder and on a daily basis, spend at least an hour or two shredding. A mobile shredding company is indeed the most cost-effective and secure way to shred and destroy your sensitive information. Information Security & Safety: Using mobile shredding trucks will help your business eliminate the risk of identity theft. With mobile shredding and destruction services, there are cameras which will document the shredding methods to ensure they are done in a secure fashion. Your business will rest easier knowing that your information was safely destroyed. Compliance with State & Federal Regulations: Because the mobile shredding service is executed on site, in front of your eyes, they will provide you with an official Certificate of Destruction. This certificate can be used to prove that your business has remained compliant with state and federal regulations. Your Employees Will Remain Productive: It’s common for any quality mobile shredding and destruction team to come directly to your location to handle the whole process on site. Having a third-party manage this time-consuming work helps your employees remain productive and keeps their focus on more important work. Saving Time, Energy & Trees: Mobile shredding companies can save the environment most effectively. These companies typically have advanced shredding and destruction equipment that can handle larger jobs in a faster timeframe. When a business chooses mobile shredding, the methods in which they process paper helps save time, energy and in turn, trees. These mobile trucks are always ready to haul your shredded materials to a recycling plant. Most Cost-efficient Method: There are always higher costs associated with doing the shredding and destruction internally. It’s more expensive to use a small office shredder because it’s not reliable and it has to be consistently maintained and repaired. If you hire a professional shredding service, the cost per shred will be less – instead, the shredding service will have to take on the costs of maintaining their equipment. IntelliShred has been a high-quality mobile shredding company for over 20 years. Our team of shredding and destruction experts will be able to answer all your questions and help alleviate the burden of eliminating your confidential and sensitive information. We help our customers consistently shred and destroy paper, hard drives, CD’s and DVD’s, Video Cassettes, Microfilm, Microfiche and more. Contact us today to learn more about our services and let us help you purge your business materials. Protecting confidential information can be one of the biggest challenges for companies today. Every size company – from small mom-and-pop businesses to large corporations, consistently face the threat identity theft. It’s been estimated that about 9 million people have had their identities stolen each year. Drained accounts, damaged credit, information about medical treatments – paper documents, information storage devices and files are at risk, so it’s necessary to put the right security measures in place. Having a written identity theft program is essential for every company. In fact, the FTC’s Red Flags Rule requires many businesses and organizations to implement a written identity theft prevention program. The whole idea behind it is to help detect the “red flags” of identity theft in their day-to-day operations, take steps to prevent the crime, and mitigate its damage. This type of safety net can help businesses spot suspicious patterns and prevent the costly consequences of identity theft. Reduce the amount of confidential information you store. It’s essential for your business to store confidential information, but if you maintain too much of it, it’s easier for criminals to steal. You should try to only store information that’s absolutely necessary to conduct business. If it’s possible to maintain your operations without storing all kinds of data, it may save you from higher risk of theft. Be sure that your company has a data destruction policy. The easiest way to increase identity theft protection is to eliminate confidential information that’s no longer relevant. This not only includes shredding paper documents, it also includes the destruction of computer equipment, hard drives and data storage solutions. Simply sending old equipment out to the landfill is a big mistake, this is where local document shredding services come in. Protect all of your paper documents. It’s critical to keep any time-sensitive printed information under lock and key to prevent unauthorized access. It’s wise to only allow the most trusted employees to have access to these documents and storing them in a secure location, such as a safe. Once documents are no longer relevant, call up your local document shredding services. There should never be a chance that employees leave important documents out in the open unattended. Use firewalls and anti-virus software on all computer systems. Digital fraud is also a serious issue, so you should make sure all of your computer systems have the appropriate level of protection. A firewall, anti-virus and anti-malware technology is all highly recommended. It’s also crucial that your employees are given a comprehensive security awareness training, so they are equipped with the skills to protect against a variety of threats. The training should include information on the malware, ransomware, and Trojan horses. Use an on-site shredding and destruction service. Local document shredding services can save you money and provide you with confirmation that your confidential information has been destroyed properly. Professional shredding companies provide a Certificate of Destruction, which offers documentation of each shred and protects your business in the event of an audit or lawsuit. Think about the amount of time an employee could spend on shredding with a small office shredder – you can’t ignore that precious time and wages will be wasted. Plus, the depreciation and maintenance of the office shredder could cost even more over time as hiring a shredding service. Good local document shredding services shred more than paper, they have the ability to handle destruction of other information storage devices. If your confidential data gets into the wrong hands, your company, employees and clients could be exposed to information fraud and identity theft. In turn, your business could be subject to severe penalties, fines, bad PR, and lost business because you did not remain compliant with current laws governing information. At IntelliShred, our team is made up of experienced information security technicians that can help your organization stay compliant with the ever-changing federal and state information destruction laws. Contact us today so we can help you manage your confidential waste shredding and avoid the risks of identity theft. There are essential external services every company needs to maintain their success. One of the most important is a professional shredding and destruction company. There are many shredding companies here in NJ that have the experience and outstanding service you’re looking for. With 20 years of helping customers shred and destroy their confidential documents, hard drives and other media storage devices, IntelliShred continues to lead the pack in the Garden State. Their fleet of mobile shredding trucks can execute jobs of all sizes, efficiently and securely. They are proud members of the National Association for Information Destruction (NAID) and have consistently achieved AAA Certification – the highest security level in the shredding industry. Customers consistently depend on them for security, quality service, and integrity. Contact them today for more information. Shred-it is designed to help businesses of all sizes protect themselves against the threat of privacy breaches. They have developed proprietary technologies and services which help them serve both large and small organizations. Shred-it has customers across almost every sector – from government and healthcare, universities and colleges, banks and financial institutions, to police forces, military, and intelligence agencies. Shredding Services of NJ was established in 2006 for business and residential customers who have a need for on-site and off-site document destruction at an affordable price. Their services are scheduled by appointment and they can accommodate any special shredding needs. Their annual and monthly service programs save customers thousands of dollars each year by reducing costly storage and file space used for their outdated confidential records. By offering their customers a complete line of Dahle paper shredders they can meet their document destruction needs from one source. As the only ISO 9001 certified secure on-site shredding company system in America, PROSHRED® frontline operations and procedures are continually audited by both ISO 9001 and the corporate franchisor. PROSHRED® pioneered on-site shredding over 30 years ago and continues to excel at providing its shredding services. Protect your confidential documents with the most secure, well-trained and responsive on-site shredding service available. Ecoshred provides the most professional information destruction services available in NJ for the best value. They can render all material legally non-negotiable and indecipherable to save your business from the risk of identity theft. They work to lower their impact on the environment with a fuel efficient, clean burning mobile shredding fleet. You can rest assured that their shredding services are done in a secure, controlled environment, without the use of fossil fuels. Founded over ten years ago, Confidential Shredding’s team collectively has more than 25 years’ experience in the shredding and recycling business. Throughout the tri-state area, Confidential Shredding builds security programs designed specifically to fit the needs of each specific customer. DocuVault provides the highest quality shredding services that will securely manage your confidential documents and other media storage devices. Their outstanding personal service and quick response to your call helps them achieve excellent customer service standards. IDSAutoshred offers one-time purge onsite shredding and recurring daily, weekly, and monthly on-site mobile shredding for their customers. Their uniformed, bonded IDSAutoshred Representatives will come to your location, empty your bins, and safely shred the contents on-site in state-of-the-art shredding trucks. Other items such as CD’s, X-Rays, casino chips, hard drives, etc. can be destroyed as well. Security Shredding Enterprises regularly services a variety of NJ-based businesses, including doctors’ offices, law firms, CPA’s, and insurance offices. They take pride in offering the highest level of customer support in the industry and they are an independently-owned business – so they are flexible and ready for hire. Polar Shredding provides dependable, cost-effective, on-site, and secure mobile paper shredding for New Jersey, Pennsylvania, Delaware and the surrounding areas. They opened our doors in 1968 and have never lost or mishandled a box or piece of paper that was intended to be shredded. Their services include shredding for scheduled daily, weekly or monthly pickups, or even for a one-time purge. Because they’ve been in business almost 50 years, their customers keep coming back again and again. Polar Shredding is also proud to be a veteran-owned leader in New Jersey. #11 Guardian Document Destruction Co. Guardian Document Destruction Company provides a variety of shredding and destruction services. Whether it’s a one-time purge or a recurring shredding service, our team of experts will be able to provide a secure, cost-effective solution for your business. No matter the type of shredding or destruction service, they are proud to serve their customers. Safe Shredding, LLC provides dependable, cost-effective mobile shredding for Northern, NJ and the surrounding areas. Safe Shredding’s team of trained Destruction Specialists will come to your location to help you properly dispose of obsolete records and confidential documents. They are a member of the National Association of Information Destruction, Inc. (NAID), a global organization that promotes the highest standards of ethics for the information destruction industry. They also recycle whatever’s leftover, so that your business can help save the environment. At American Shredder in Lakewood, NJ, the high-quality shredding services they provide do not go unnoticed. They specialize in document destruction and paper shredding for your private, commercial, or industrial needs. Their experienced team can provide a fair estimate, meet a prompt schedule and provide answers to your shredding questions. This company not only provides shredding, but professional media destruction services to help you dispose of tablets and other digital media storage devices. Shredding electronics prevents any undamaged components from being put in a new device. They will help you safely and securely dispose of your confidential information. Businesses are always going to be at risk of identity theft if they don’t properly handle the destruction of important, sensitive or proprietary information. Document shredding is the safest way to ensure your sensitive documents will not be at risk for identity theft. However, you must make sure that your documents are shredded properly, because if not, they can be easily pieced together. Do not use scissors to cut your documents – that is certainly not a secure way to shred or destroy them. Identity thieves will avoid any theft that requires a lot of effort, they will more likely steal if they have convenient access to your confidential information. Shredded documents are often not properly disposed of. In order to ensure your customer and employee information remains secure, it’s best to hire a professional shredding service and to know which documents to shred. There are several reasons why the items listed above are coveted by thieves. There’s an efficient and secure way to avoid having that information fall into the wrong hands. Professional shredding services make it easier for companies to not only have peace of mind, but they also allow your business to remain efficient and productive by not wasting precious time shredding documents all day. There is always a risk that your company could succumb to the dangers of identity theft. Although there are certain laws which protect companies, there’s always the chance that your employees are not handling your confidential information with kid gloves. Your company could be held liable if an identity theft victim’s sensitive information was not properly destroyed. The best way to handle your sensitive documents and keep them from getting into the wrong hands, is to know which documents to shred and to hire a professional shredding service. A professional shredding service can efficiently shred or destroy documents, discs and other storage devices which contain private information. Be sure to hire a vendor who is NAID certified and is capable of providing you with a Certificate of Destruction when your shredding is complete. IntelliShred has spent years servicing the tri-state area. Our expertise helps us provide efficient, secure document destruction services. Contact us today if you have any questions on which documents to shred or to learn more about our services and how we can help protect confidential information. Operating a daily business can be challenging and eliminating unnecessary expenses can be difficult. In order to save that money from flying out the window, every business should aim to achieve efficient operations, while attempting to reduce expenses and increase profits. One of the ways a business can save money is to employ a professional bulk shredding and destruction service. The smartest way to achieve savings is to offload the large volume of paper documents and other information storage devices to a bulk shredding service. With only using a small office shredder, you’ll be spending more money when you must deal with the additional costs associated with using the machine (cleaning, maintenance, replacement parts). Most bulk shredding professionals will offer on-demand services, so you will only be paying for what you’re using. It’s way more convenient for you to outsource this work to a professional service – as it is a waste of time to do it in-house. When tasking your employees with doing this time-consuming work, your company will lose productivity and there could be additional expenses for the business, depending on the volume of shredding required. Even more savings will occur when your employees return to their productivity levels. They will no longer be sitting around a tiny office shredder attempting to handle the shredding of your important business documents. To calm the identity theft at work worries of customers, your business should share the manner in which their sensitive data is being used, stored and disposed of. It’s essential for businesses to provide detailed information on exactly how these tasks are performed. Bulk shredding service companies will understand how to execute the shredding and destruction process in a confidential manner. Remaining compliant is another crucial step for businesses today. It’s necessary to maintain compliance with current federal privacy regulations. Without compliance, businesses could face a more significant risk of severe fines or legal actions. The financial benefit is that this type of professional service will save you from any legal action by shredding in a secure manner, ensuring your private information remains confidential. No matter the size of your business, the best companies out there are great at providing transparency and excellent service quality. Professional bulk shredding also gives your customers the peace of mind that their data is handled in a very confidential and secure way. When your customers are free from worrying about identity theft, they’re more likely to become loyal customers, therefore reducing your company’s client acquisition costs. Convenience, regulatory compliance, and incremental cost savings. Three important reasons why you should not wait to hire a professional bulk shredding and destruction company. Since 1999, we have been providing Information security solutions to the tri-state area. We are committed to maintaining the highest ethical standards and practices, and outstanding, personalized service. 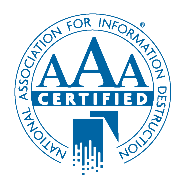 Our membership in the National Association for Information Destruction (NAID) has been consistent and we achieve AAA Certification every year – the highest security standard in the shredding industry. Contact us today for more information about our services. With the economy being volatile, all companies are insecure about their financial status. There are many ways to reduce expenses and increase profits, but most companies overlook their everyday expenses which tend to add up! Adjusting to smarter business practices can help companies be more effective in budgeting and help prevent excess energy waste. For instance, to save electricity, computer usage can be reduced drastically if machines are shut down at the end of the day. To save on office supplies, making the switch to electric hand dryers can save a lot of money as well. One other important way to save is to hire business shredding services. Not only will this choice will restore your employees’ productivity, it can also protect confidentiality and ensure your business is compliant with federal privacy laws. A small office shredder does not allow you to destroy paper in large volumes and there are maintenance costs you will spend on such a machine. Professional document shredding companies provide on-demand services and you’ll be paying less because of the larger volume they can handle at one time. Business shredding services bring many financial advantages that are unseen. Selecting business shredding services that are reliable and secure will be crucial. A simple office shredder will not destruct your documents properly and will ultimately reduce employee productivity, keeping them from more strategic tasks. It’s not clear why businesses allow their employees to be distracted by time-consuming administrative tasks. Hiring a business shredding service will keep productivity at the level it should be and it will save the company time and money. There are also compliance requirements that must be adhered for shredding confidential information. Not remaining in compliance could significantly increase the risks of fines and legal actions against the company. This is another reason why document destruction is necessary. Sensitive or confidential information is governed by laws for archived documents and their destruction. Data falling into the wrong hands is not something any business wants to deal with. Confidential data that is not currently being used should be shredded and disposed of. When you hire business shredding services, their trucks will come to your location for more convenient document destruction. Most of these services are mobile, and their mobility allows them to do the work more efficiently and securely. The remaining waste should also be handled in a secure manner so that there is no risk of identity theft or costly fines. Every business should understand that hiring a professional shredding service will not only protect sensitive data and ensure regulatory compliance, it will also help reduce costs over time. The significant cost savings is more valuable than you can imagine. IntelliShred has been helping customers with business shredding services for many years. We value our customers and can guarantee a successful business relationship. Our fleet of mobile trucks will be able to handle the destruction and disposal of large volumes of paper and other media storage devices. Contact us today to learn more about our services. Today’s business environment is challenging enough without the fear of an information security breach, or outright identity theft. Information security has become a necessity for every business that handles confidential information. Regardless of the industry or the size of your company, these privacy threats are very real, and can be quite challenging to overcome. Even though these threats can affect every business, according to several reports, the following sectors have been known to be the most at risk: Healthcare, Business, Educational, Financial, and Government. For these businesses, the destruction and disposal of paper and other information storage items must be secure. Whether you work in a school, a medical office or a financial services firm, it’s important that your business has a strict information security policy. It’s essential to also remind your employees to adhere to the company’s confidential information disposal practices. Businesses should be shredding confidential information on a regular basis. There is proprietary information, like price lists, research, proposals and bids, email lists, customer information, if stolen or neglected can be a tremendous loss. Not disposing of hard drives or paper documents properly can also expose your business to horrible consequences. Sensitive documents should be destroyed according to schedule. Typically a business will keep documents for a number of years, but in order to remain compliant, they must follow the governing legal requirements for privacy. When the retention period is over for confidential information, all records should be destroyed. Even ordinary business records should be destroyed. Identity thieves and industry competitors could monitor your daily success if they get access to your daily trash. Records and memos, including misprints, drafts and other important information can get into the wrong hands causing total mayhem. There are dire consequences for not shredding confidential information. Recycling is not acceptable for sensitive or confidential data. Recycling companies often use un-screened, minimum wage workers to extract paper from recycling facilities. The workers must labor extensively to sort through paper. Often, these conditions are not closely monitored. The acceptable paper is stored for indefinite periods of time until there is enough type of that paper to sell in bulk quantities to post-recycling entities. The sorted paper is sold, still intact, to the highest bidder. These buyers are often overseas and can store the baled paper for weeks or months until it is used to make recycled consumer goods. It’s best to choose a certified product destruction company which provides a certificate of destruction, which gives your business compliance with federal guidelines. A professional and accredited shredding confidential information service is ideal, because if an identity theft case ever surfaces, your business could be held liable. Most companies provide certificates of destruction which prove that the process was executed properly. Do You Need Shred Containers? A company’s future success depends on many smart business decisions over the course of its lifespan. Although most choices are made with short-term cost savings in mind, there are a few with significant long-term savings that should be considered. For example, hiring a professional shredding service and purchasing secure shred containers should be essential for every size business. No matter the industry or type of business you’re in, you will definitely need to remain compliant with privacy laws. If confidential information that exists in document form is not properly destroyed, it can get into the wrong hands, which would make your company liable for identity theft. Small office shredders cannot adequately destroy your documents with sensitive data, so hiring a professional shredding service is always recommended. Small office document shredders tend to have many flaws, leaving your business at risk for legal issues. Hiring a shredding service keeps you from having to train your staff on what needs to be destroyed and what doesn’t. Typically, a shredding company will also give you a certificate of destruction to prove the information was properly destroyed, ensuring the privacy of your clients. There is another smart purchase every company can benefit from – secure shred containers. There are two types of shred containers, the first is only meant to collect on a daily basis, and the others are meant to store paper for longer periods of time, ideal for bulk shredding. This storage container is as large as a recycle bin, but its design is more attractive for the office environment. There’s usually a mechanism for locking and it typically holds 100 pounds of paper. This size shred container holds just over 350 pounds of paper, and its strong security ensures that confidential documents are easier to contain and transport. There are regulations which govern secure shred containers – the guidelines exist under American National Standards. Buying high-quality bins is important, because inferior plastic bins will have a significantly shorter lifespan. There are several manufacturers which produce high-quality resin, injection-molded, shred containers. Regardless of which type of bin you use, you should be sure to purchase some kind of storage for confidential documents. Your shredding service provider can also recommend which one is best. IntelliShred provides both mobile shredding services and secure shred containers for businesses. Our state-of-the-art trucks come directly to your location and destroy your hard drives and other materials on site. We are committed to saving the environment, so we can deliver destroyed materials to the proper metal and electronics recycling center. 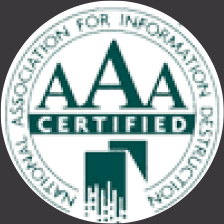 We are certified by the National Association for Information Destruction (NAID), a trade organization which provides a voluntary certification program for member companies that provide information destruction services. IntelliShred has earned the NAID’s AAA Certification and we only send electronic waste to certified e-waste recycling companies that comply with federal and state regulations.